I was working late last night helping to put the finishing touches on the many ways that we're sharing tonight's landing with the world, but I did pause for a moment as the countdown clock on my screen raced past the one day mark (yes, raced - I swear those seconds are coming off faster than they should). It now reads just over 12 hours, and it's really hit me--We're measuring the time until landing in hours! I started working on the systems that we are using to command and control Curiosity in 2004, right after spending many years in a similar position on the Spirit and Opportunity rover mission. At that time, the landing of the as-yet-unnamed Curiosity rover felt like it was eons away. It didn't take long before the immensity of our task made the years that we really had to prepare seem surprisingly few. 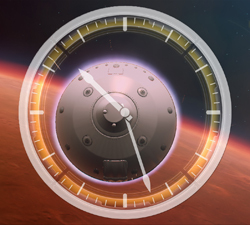 Last year the team quietly leapt the one-year threshold while intensely focused on preparations for the November 2011 launch, but I'm sure everyone felt a flutter in our chests the first time we considered how many months were left before Curiosity would land. With the blur of activity that was July, it seems like we switched from counting weeks to days in an eye blink. And now I get a little chill when I consider that we'll soon all look at that clock and see only minutes. I'm betting that it's around then that this over-eager countdown clock will decide to yawn, relax, and settle into a maddeningly leisurely pace that makes those minutes feel like hours again. It's a good thing there are only 60 seconds in a minute.